Despite (or maybe thanks to) all the damn good Black Friday and Cyber Monday deals you've taken advantage of since Thanksgiving, there's a damn good chance you've spent way more money than you should have over the last few days. 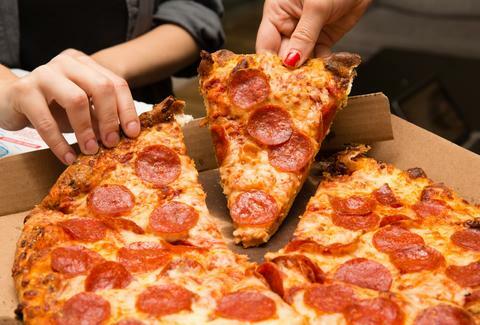 Thankfully, it looks like you may be able to make up for it a bit with your next pizza order now that Domino's has launched a huge new deal for 50% off all pizza orders through the first week of December. As of Monday, Domino's is taking 50% off all menu-priced pizzas ordered via any of its many online ordering platforms, including its website and mobile apps, according to a press release. All you have to do is select the 50% off coupon, then choose your pizzas and toppings as you normally would and stare at the delivery tracker page until your food arrives. The only two requirements are that you have to order through the aforementioned digital platforms to get the discount and you have to order before the promotion ends on December 7. It's dangerously easy. Perhaps the only downside to the deal is that it doesn't apply to other menu items, so you'll have to pay full price for your obligatory Stuffed Cheesy Bread and Parmesan Bites (that's where they get you). All said, it's hard to go wrong with an easy dinner of half-price pizza, even if it's super basic fast food pizza. Tony Merevick is Senior News Editor at Thrillist and could go for some pepperoni pizza right about now. Send news tips to news@thrillist.com and follow him on Twitter @tonymerevick.